While every tattoo has some sort of symbolism behind it, the swallow tattoo has become a staple in the ink culture, and swallow tattoo meanings have been adapted as the world changes so that generation after generation can keep appreciating this simple sailor tattoo. It has a long history and has appealed to a lot of different personality types and lifestyles, making it very versatile. Swallow tattoos have been around since the days when shipping was accomplished with actual ships and every journey was a direct risk to every sailor’s life. The tattoo is believed to have stemmed from the swallows’ behavior and patterns, which sailors used as a guide, much like the North Star. Sailors had noticed that swallows tended to congregate around shores and civilization, so if they began to see them in the sky while they were out at sea they knew that land wasn’t far. Sailors began to view the swallow as a sort of “welcome home” and good luck charm. The swallow tattoo is said to have definitely started as a sailor tattoo, and it stayed that way for quite some time before others began to emulate seamen. The story of the first swallow tattoos says that the sailors who received them happened to crew on a ship called The Swallow. There were seven sailors total, and the reason that they got the swallow tattoos was because they had staged a mutiny and they wanted to be able to recognize each other during the fray easier. Other sailors began to get swallow tattoos over time, mostly so they could function as decoys for the first seven, but the popularity of the sea tattoo took off on its own accord, and soon the meaning behind the tattoo began to change entirely. The main use that sailors found for swallow tattoos was a way to mark experience. This was when swallow tattoo meanings began to truly develop. 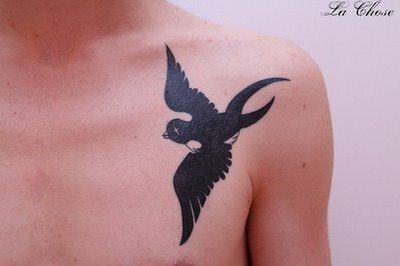 The symbolism of the swallow tattoo solidified with time to represent a measurement of how long a man had been sailing. A sailor would be able to get a swallow tattoo on his chest when he had traveled 5,000 nautical miles, and if he made it through another 5,000 nautical miles he could get another tattoo on the opposite side of his chest. 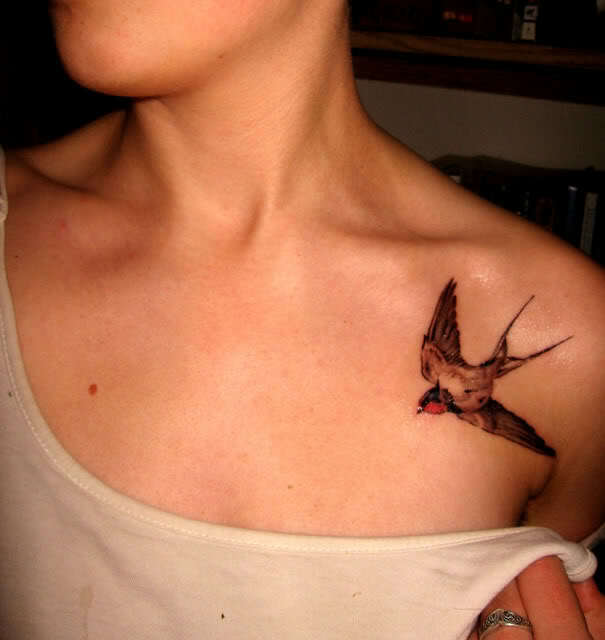 Sailors could also get a swallow tattoo for completing specific difficult tasks, like sailing through dangerous seas. Sailing was such a hard lifestyle in those days that it was rare for a sailor to be able to get more than one or two tattoos. 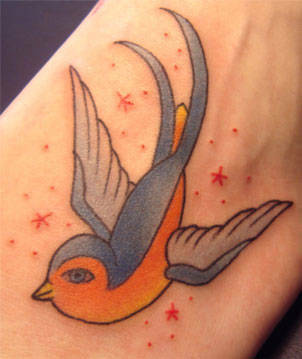 The swallow also symbolized luck and a safe journey home for the sailors, but that was a secondary consideration. The swallow can sometimes represent that someone is a “jail bird” and had once been in prison. Swallow tattoos still represent a sense of returning home, only now it’s stronger. Swallow always migrate to a specific location every year, so the swallow is a great symbol for returning safely home or having pride in your roots. A swallow tattoo on the top of someones’ hands can mean trouble if you anger them because men used to get the tattoo there as a way of saying they’re a fast fighter. Swallow tattoos are great for couples and close family members because it represents loyalty and steadfastness. Swallows find one mate and stay with them for life, so a tattoo of two swallows together or matching tattoos on two people means that they hold affection for someone close to them. Sailors in the British Royal Navy have been known to get swallow tattoos on both of their wrists as a sign that they have completed their duties successfully. In Greek mythology the swallow would guide the souls of the recently departed to the Underworld, ensuring their safe passage. In Christianity the swallow can signify the resurrection or new life. Many people get a swallow tattoo to represent a fresh start or closing a chapter in their lives. They usually wish to convey that they are moving on with their lives. While there are a few places where you should avoid getting a swallow tattoo, you can place one of these old sailor tattoos almost anywhere. The traditional sea tattoo version of a swallow tattoo was usually all black or a solid, muted color, but there’s nothing stopping you from designing your tattoo differently. 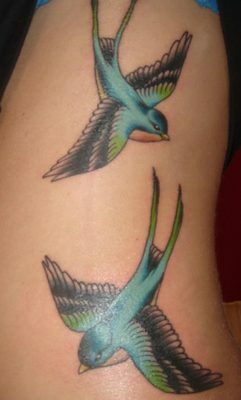 Many people have beautiful, vibrant swallow tattoos now, so design options are virtually endless. If you are looking for other cool bird tattoo ideas, you can head over to our past articles here.